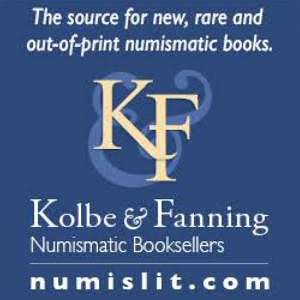 The Numismatic Bibliomania Society (NBS) is an educational association founded in 1979 to support and promote the use and collecting of numismatic literature. Numismatic literature includes books, periodicals, catalogs and other written or printed material relating to coins, medals, tokens, or paper money, ancient or modern, U.S. or worldwide. Membership is open to any individual or association interested in the study of numismatics and the study and collecting of numismatic literature. 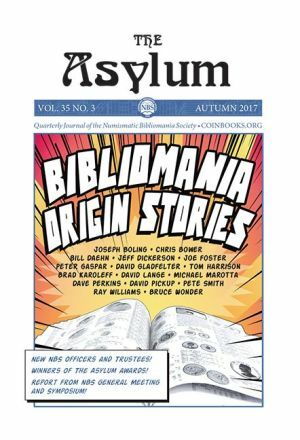 As a member of NBS, you'll receive a valuable back issue of The Asylum (the society's official print journal) and all subsequent print issues upon publication. Invitation to participate in the society's Annual Events: the General Membership Meeting, Educational Symposiums, and a fund raising auction (all held along with the ANA's World Fair of Money each August). Voting to select NBS Officers and recipients of the Society's annual literary awards - the Joel J. Orosz Award (best new article in The Asylum) and the Jack Collins Award (best new author). Members are also encouraged to submit original manuscripts to the Editor to be considered for publication in The Asylum. NBS is a proud supporter of both the ANA and ANS libraries.